Despite our best efforts, kids are magnets for coughs, colds, and stomach bugs. While you can sometimes bring on a speedy recovery with extra TLC and cartoon privileges, keeping them hydrated — especially when there’s tummy trouble — is absolutely essential. But as every parent knows, that’s easier said than done. Enter Drip Drop, a new doctor-developed powder that mixes right into water… and actually tastes good. (Both the lemon and berry flavors passed the toddler and grown-up tests in our house.) 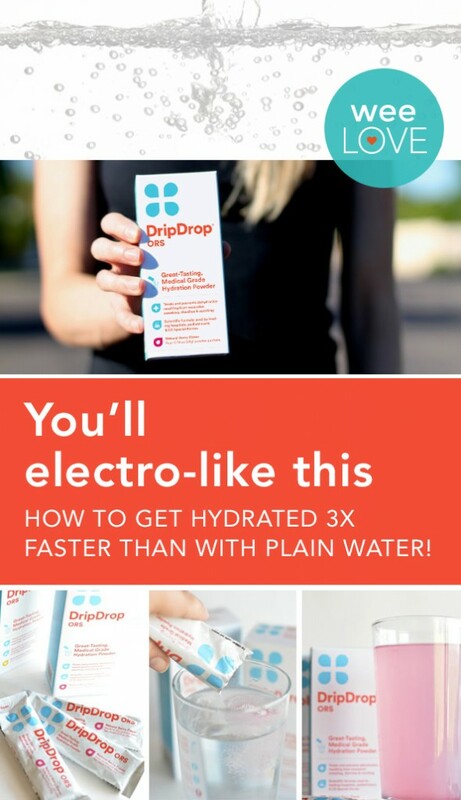 Used in top hospitals across the country and available over-the-counter, Drip Drop’s mixture of electrolytes and sugars provides faster hydration (3x faster than plain water!). Plus, it has half the calories of super sugary sports drinks — without any of the iffy artificial stuff. The story behind it is pretty amazing, too: a med student from the Mayo Clinic created it after witnessing devastating dehydration in Guatemala, but saw broad potential (turns out 75% of Americans are dehydrated). So, awesome for kiddos… but also pretty great when you’re pregnant or breastfeeding, when fluid intake is especially important. Or when you need to minimize the after-effects of some moms’-night-out margaritas (just sayin’…). This weeLove was sponsored by Drip Drop. Want to get weeLove in your inbox? Sign up here! And if you have a suggestion for something we should cover, click here.